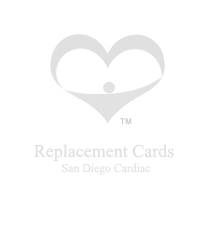 Once you have completed your payment you need to send an email to info@sandiegocardiac.com stating that you just completed your replacement card payment & please include your full name, class, date of class & mailing address. We will then process your replacement card and mail it out in 3-5 business days. If you have any questions you may contact us at any time during regular business hours, thank you.